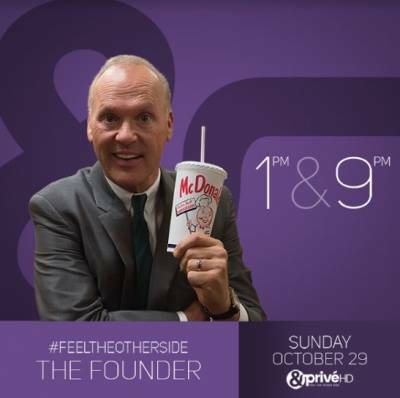 &Privé HD, the ultimate destination for fine cinema is all set to premiere the critically acclaimed movie ‘The Founder’ on 29th October at 1:00pm and 9:00pm. The powerful biographical drama has one of the most compelling stories starring Academy Award winner Michael Keaton as the founder of the much-loved fast food chain, McDonalds. Acclaimed actors Nick Offerman and John Carroll Lynch also star in pivotal roles as the brothers who founded the original restaurant. The movie chronicles the life of Ray Kroc, the entrepreneur who gave the world McDonald’s. It narrates his journey as a salesman who took a small burger joint in San Bernardino, California, franchised it around the country and turned it into the McDonald’s Corporation that we know today. Fuelled by determination and ambition, we see Kroc’s rise to power as he uses ruthless corporate methods to overtake the innovative family owned restaurant and turn it into a corporate giant. Keaton’s soulful portrayal of Kroc stands as the backbone of the film. Holding true to its promise of presenting nuanced cinema, &Privé HD brings you a film that explores the multiple shades of human nature.